‘The Isle of France’ was collected by H.E.D. Hammond from Joseph Elliott of Todber, Dorset. It concerns a transported convict who is on his way home at the end of his sentence, but is shipwrecked on the island of Mauritius. l’Île de France was the name given to Mauritius until it passed from French to British control in 1810. 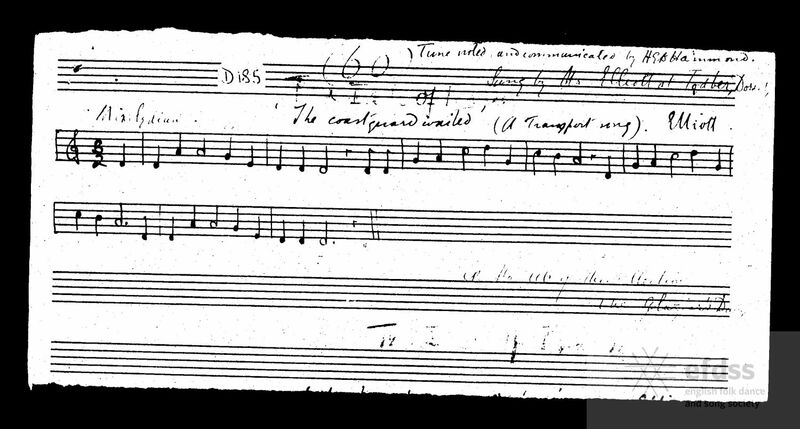 I discovered the song while looking for something else in the Hammond MSS, which at the time were available only on microfilm at the Vaughan Williams Memorial Library, but which are now of course included in the Full English archive. The Isle of France, from the Hammond Collection, via the EFDSS Full English Archive. In about 1850, when he was around 19 years old, he signed on as a fisherman in the Newfoundland cod fishing industry, sailing out from Dartmouth with about 60 other men (mainly men from Dorset). He was out there for 3 or 4 years, and told the Hammond brothers that that was where he learned his songs. The song appeared frequently on ballad sheets – check out these versions at Ballads Online. The Isle of France: broadside ballad printed by H. Such of London between 1863 and 1885. From the Bodleian collection. I recorded the song with Magpie Lane on our CD The Robber Bird. Below you will find a live recording of us performing it last year at the Red Lion Folk Club in Birmingham. Recorded at the Red Lion Folk Club, Birmingham, 6th March 2013. I learned this from the Boys of the Lough songbook (Music and Songs from the Boys of the Lough, Gilderoy Music, 1977). When I got the book I had heard several LPs by the band, and really admired Cathal McConnell’s singing. I had not, however, heard the album Recorded Live on which this song appears. I heard that LP just once, some years after having learned the song. My recollection is that I felt that, in having learned the song from the printed page, I had ended up singing it quite differently from the way it was performed by Cathal McConnell. But I’ve just listened online to Cathal singing the song – again on a live album, Live at Carnegie Hall – and actually it’s not that different. Except that, much as I enjoy singing the song, I will never sing it as sweetly as he does. Do yourself a favour and give him a listen. Here’s a song from the Copper Family repertoire which I’m pretty sure I’ve never heard sung by any member of the family. I learned it from Bob Copper’s book A Song for Every Season (it’s also in The Copper Family Song Book) but it’s not on the 4 LP set of the same name, or on any more recent Copper Family albums. There are also a considerable number of recordings which are copies, given to him for interest’s sake, by other collectors. He has also sold these illegally via Folktrax. Bob Copper told Kennedy that he was learning the concertina. Peter told him that he would like to hear what he sounded like. Bob sent him a “pretty ropey” (Bob’s words) self-recorded practice tape. This ended up being released on Folktrax. The origins of the song itself, and what significance if any should be attached to the colour of the cockade (white? blue? green?) in different versions of the song, are addressed in his usual pithy and informative style, by the late Malcolm Douglas on Mudcat here and here. White cockade – broadside ballad from the Bodleian collection. I don’t think I’ve ever sung this in public, and may never do so. In a world where the version popularised by the Watersons is universally known, going to a folk club or session and singing a version with a slightly different set of words and refrain is asking for trouble. Here’s another one from the Cantwell family of Standlake in Oxfordshire (see last week’s entry) which Peter Kennedy recorded from the brothers Fred and Ray in November 1956. A different – part-sung, part-spoken – variant of the song is performed at the end of the Symondsbury Mummers’ play. Kennedy recorded that also in the 1950s; you can hear a more recent recording made by Bob Patten of both the play and the song on the British Library Sound Archive website. In fact a search of the Roud Index / Full English suggests that versions of this song were widespread in the South of England. Lucy Broadwood included it in both English County Songs and Sussex Songs. Her version was reproduced from Davies Gilbert’s Some Ancient Christmas Carols -see www.hymnsandcarolsofchristmas.com/Hymns_and_Carols/servingman_and_the_husbandman.htm. The song appeared in The Loyal Garland (1686), and is in the Roxburghe Collection; Malcolm Douglas’ notes to the song quote Simpson, The British Broadside Ballad, as dating it to “1665 or earlier”. A similar version to the Cantwells’ was performed by Janet Blunt’s indefatigable informant William Walton of Adderbury in North Oxfordshire, sometimes with the assistance of Samuel Newman – the song is, after all, clearly designed to be performed by two people. When we were assembling material for inclusion on the Magpie Lane CD, The Oxford Ramble. I think I suggested this song, knowing of its Oxfordshire connections. In fact Ian Giles already knew the song, having learned it from the Young Tradition LP Galleries. I’d also heard it on that record (or rather on Galleries Revisited – I’m a bit younger than Ian!) but made a point of getting hold of the Cantwells’ version, on one of those dreadful, tatty old Folktrax cassettes. I was not particularly surprised to learn that Peter Bellamy and Royston Wood had in fact recorded a fairly faithful reproduction of the song as sung by Ray and Fred Cantwell. Below you will find a video of Ian and me singing the song at the first ever Magpie Lane concert in 1993, and then again – having revived the song after a long lay-off – at a concert in Bampton Church last autumn. The husbandman and servant man. Early 19th century broadside from the Bodleian collection. St Mary’s Church, Bampton, 21st September 2013. As I was going to Banbury: Ian Giles – vocal; Pete Acty – mandola; Jo Acty – vocal; Isobel Dams – cello; Tom Bower – side drum; Mat Green – fiddle; Andy Turner – C/G anglo-concertina. Holywell Music Room, Oxford, 3rd May 1993.